I have been intrigued by HAM ever since Prof.Gadre mentioned about it in one of his lectures. HAM has an amazing community and i have been fortunate to be included into one here in Pune. Special Thanks to VU3DES and VU2ASH. The HAM group in Pune is a group of highly motivated and dedicated HAM enthusiasts and regularly have conversations on the HAM frequencies. They open-heartedly encourage n00bs to get their feet wet in the HAM world.. Frankly, the initial days were tough as the jargon used in HAM is intense and i could not make out many times what the conversations meant. Slowly with Amogh’s help I figured out most of it. For Example: DIYers are called Home Brewers. 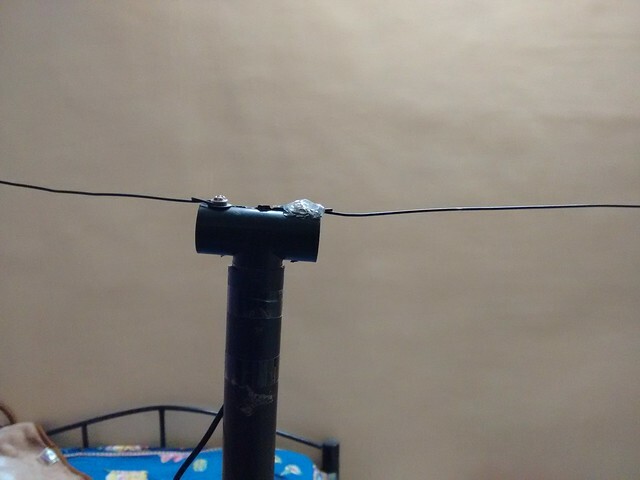 As Amogh suggested, i started with building a 2M Band (140MHz) antenna and using it with my RTL SDR Dongle. The process involved severing my already working cable that connects to the tiny antenna using which i can do lots of cool things like tracking flying objects using ADSb, A post my hands are itching to write but looking at the growing intolerance, a few friends have cautioned me into not exploring stuff in the grey area more. If anyone with a better understanding of the grey value in this area reads it, please do tell me. Nevertheless, Cool things have to be risked to achieve cooler things. There you go, nice cable. Well, 2M is the n00bs band. Listening stuff is pretty easy with basic components costing less than a Vada Pao . RXing to most things (not all) is legal and this was quite relieving. BTW, the easiest antenna i plan to build was a Vertical Dipole. It largely has two(dipole) elements/wires/conductors that have a strict length and are (as the name suggests) oriented vertical to the ground. There is a simple equation that governs the length of the antenna elements. The SDR cable is essentially like those old RF in Co-Ax cables we receive cable TV from in our houses. The outer part is negative or shield and the centre part is signal or positive. I got the cheap iron wire that is used to tie re-bars in construction; they were frankly very sturdy and held shape. I measured and cut 19.6 inch elements with a little room of bending it. The frame (well sort of) was made using a T junction and pipe segments with Tinned nut and bolts to the ends as they can be soldered. 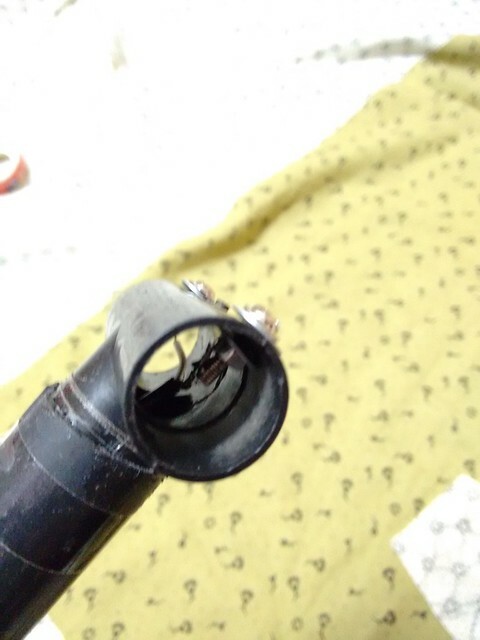 I hot-glued one end and kept the other end free. This allowed me to fold the antenna and take it out of the cramped window and re-open it again outside. Now it was time to search for a open space. Since most people talk using Handies (Hand-held radios) with too low power(5W is my guess) and i am apparently the farthest from them. Most of them are in Pune, while I am pretty far away in PCMC . Also, the height at which they transmit also matter a lot. The only open place was a little used balcony. 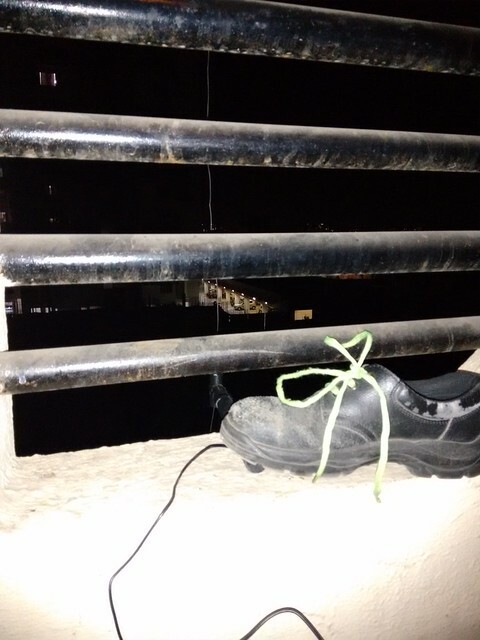 I made my base there and fixed the antenna with my Safety shoe. The SDR settings are 145.1Mhz and modulation is NFM. Next up? 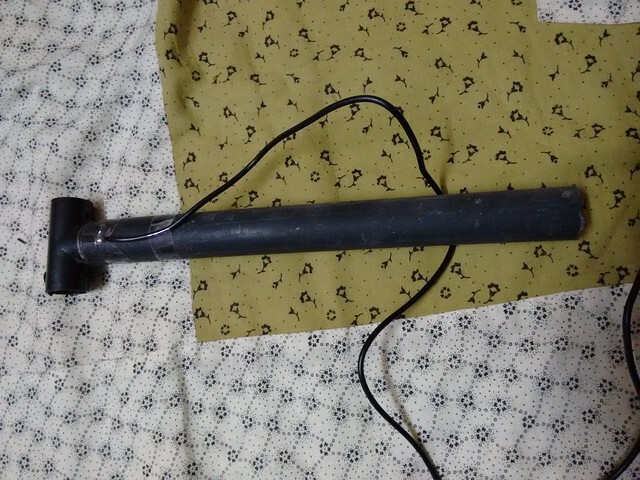 I will probably use my not-in-active-use raspberry pi to make an always ON HAM receiver tagged to our frequency and also improve the antenna. Do you have any leads on things that can be done? Please do share in the comments section below.